Tata plans to start selling the Nano minicar in Europe late next year. MUMBAI (Bloomberg) -- Tata Motors Ltd., maker of the world's cheapest car, opened a plant for the $2,500 Nano model that will boost output amid rising demand for automobiles in India. The factory in Sanand in the western Indian state of Gujarat, will have initial capacity to build 250,000 Nanos a year, Tata Motors said. The facility may later be able to produce as many as 350,000 Nanos a year, the company said without elaborating. Higher production will help Tata clear a backlog of orders for the Nano as it seeks to win customers from Maruti Suzuki India Ltd. and Hyundai Motor Co., the country's two largest carmakers. Renault SA is also working on an ultra-low-cost auto for India, where the government estimates demand for cars may more than double to 3 million annually by 2015, helped by economic expansion and rising incomes. Tata aims to start selling the Nano in Europe in late 2011. 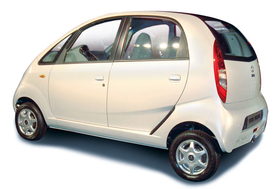 Tata Motors received 206,703 Nano orders in the initial sales period in April 2009 and chose the first 100,000 customers for the 624cc model by lottery. That car, with one windshield wiper and no radio or air conditioning at the entry level, sells for 123,360 rupees ($2,615) in New Delhi. Deliveries of the Nano began in July, and the company sold 33,875 units of the cars through April, according to data from the Society of Indian Automobile Manufacturers. “Our effort was to give people of India an affordable car,” Ratan Tata said in a speech today. “We are giving people of India a chance for personal transport.” The company canceled a press conference on the Nano because of a cyclonic storm. Indians may buy as many as 1 million low-cost cars a year by 2016, according to CSM Worldwide Inc.
Tata, also owner of the Jaguar Land Rover premium brands, can account for at least half of that market with its first-mover advantage, according to Puneet Gupta, a New Delhi-based analyst of CSM. Nissan Motor Co., Renault and Bajaj Auto Ltd. are jointly developing a $3,000 car for showrooms in 2012. The car, one year behind schedule, would be produced at a plant in the western Indian state of Maharashtra with capacity to produce 400,000 vehicles. A dedicated factory for the Nano was delayed after the automaker halted construction of another plant in Singur, West Bengal state, because of violent protests by farmers demanding the return of land acquired for the site. Tata abandoned the near-complete facility in October 2008 and began building the Sanand facility on 445 hectares (1,100 acres).